September | 2011 | Lagusta's Luscious! 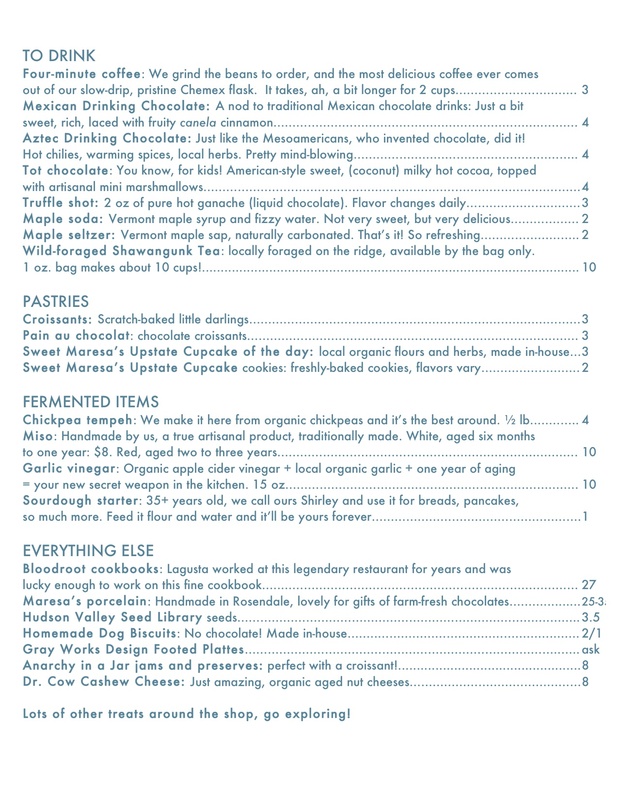 Here’s a sneak peek of our new menu—the hot chocolates won’t be available for a week or so because we’re still fiddling with the recipes, but it’s pretty much final. How much awesome stuff do we sell??? I’m astounded. I wrote this little manifesto to print out and hand out at the shop. What do you think? Q: Why do you make so many weird chocolates with savory ingredients? A: Because they taste good! And because we want to stretch the role of chocolate in your life. Originally, chocolate was a savory beverage stirred up by Azetcs 3,100 years ago. It was fragrant with chilies, spices and a rich, fermented, savory flavor. Then Europeans came along and added a ton of sugar, and chocolate’s unhealthy rap was earned. We want to restore chocolate to its role as a savory-edged treat, whose deep, lush flavors lend themselves to deep, lush ingredients like sea salt, hot chilies, fragrant coffee, bitter roasted cacao nibs, sweet caramelized onions, umami-rich shiitake mushrooms, corn, smoky paprika, and so much more. Q: Do you have sugar-free chocolates? A: No. 100% cacao chocolate (which is all cocoa, with no sugar added) is punishingly bitter, so we don’t use it. And the only other way to make sugar-free chocolate is to use artificial sweeteners. All of these sweeteners have, without exception, been highly refined and proven to cause terrible things like cancer, seizures, and many other health problems, so, yeah, we’re not going to use those. Our Coconut Pyramids are sweetened with maple and brown rice syrups (though they are encased in a chocolate shell that contains sugar), and our Anatomical Hearts are made from a relatively bitter (and thus unsweet) chocolate (66% cacao) and contain no added sugars, so if you’re looking to cut down on sugar, those are your best bet. We can also steer you to other lower-sugar choices. Q: OK, so what kind of sugar is in your chocolate? A: Organic, unrefined evaporated cane juice sugar. It’s the purest form of sugar out there, and we love it. Q: I’m severely allergic to wheat/gluten/soy/nuts. Can I eat your chocolates? A: Unfortunately, our kitchen is (as you can see!) tiny. Therefore, we cannot guarantee any products are free of contamination, even though good manufacturing practices are always used to reduce chances of cross-contamination. Please be aware that our chocolate contains a tiny amount of soy lecithin. As well, our chickpea tempeh contains a spore that is grown on soybean hulls, so it contains a microscopic bit of soy. Q: What are your thoughts on the role of chocolate in women’s lives specifically? Why does it break your heart to hear women opine about the fat content of chocolates? A: As you probably know, we have a line of chocolates named for women. 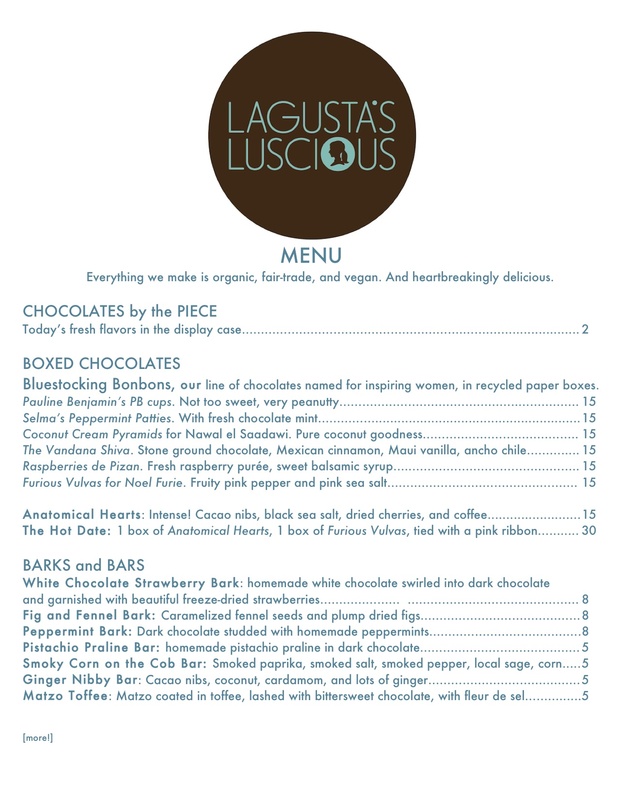 I (Lagusta) always figured I’d be some sort of feminist academic, so I’ve tried to find a way to link my Women’s Studies roots with my chocolatey career. Thus: Bluestocking Bonbons, a line of chocolates named for fascinating women. My favorite people in the world are women who come into the shop and unapologetically declare their intentions to savor the bonbons all by themselves. The truth is, even though as a society we’ve made so many feminist advances, women are still under constant pressure to conform to ridiculous notions of what a healthy body looks like. Our view is: bodies are bodies, and we like them all. The variety of bodies is manifold and unquestionable, but what’s important is celebrating who we are as people. For this reason, and with respect: it would make us so, so happy if you’d refrain from audibly agonizing about the fattening qualities of our chocolates. It contributes to a shaming atmosphere that is not part of the happy and diverse and accepting world we’re trying to build in this little blue building on this sweet little street in this lovely little town. Q: So you’re admitting your chocolates are fattening! A: Ah ha! Not so fast. First of all, chocolate itself is a stimulant, and thus keeps your heart rate happily pumping. Second, the primary fat in our filled chocolates (in addition to cocoa butter, which is the fat present in chocolate) is glorious organic, fair-trade coconut butter, which is comprised of medium-chain fatty acids which are readily used as energy in the body. Runners often eat coconut butter before a race, in order to ensure good healthy energy. Coconut butter is our bestie. Q: Do you have gluten-free cupcakes or croissants? A: I have yet to taste a gluten-free item that is worthy of the Lagusta’s Luscious name, so we do not carry gluten-free baked goods. 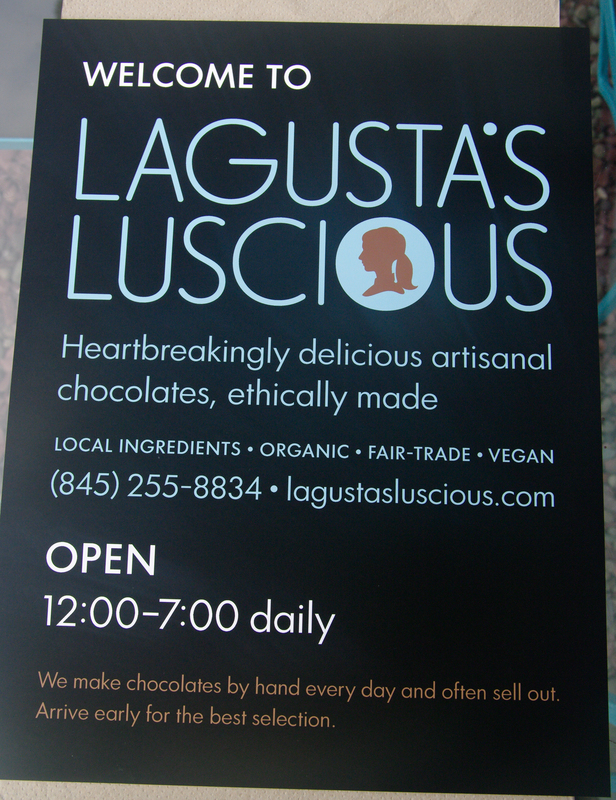 Many of our chocolates are gluten-free by default, however! Q: Forgive me for asking, but why are your chocolates so pricey? $2 a piece, come on! A: Here’s the deal. What we believe in is working for a world where all are paid a fair price for fair jobs—we believe heads of corporations shouldn’t be getting paid 500 times what the people who clean their offices get paid, and we believe the workers who pick our cacao beans should get a living wage. We also believe our ingredients should be grown and manufactured with as much care for the finite resources on our planet as possible. As anyone who’s ever renovated their house knows, doing things the right way takes a lot more money and time than seems humanly possible. But we’re committed to doing things the right way. And if it means selling less chocolate, but selling it at a price that ensures everyone who’s had a hand in making them gets their fair share, we’re OK with that. Thanks for your understanding. We love running this shop so much, it’s a joy and a pleasure every single day, and we’re beyond overjoyed that we have amazing customers who love it too. Thanks for being here!